Remember the Hanna-Barbara cartoons that we all grew up with? Super Friends, which we highlighted here recently, was one of them. Sadly Joe Barbera, passed away today in Los Angeles. He joins Bill Hanna, his former partner who died in 2001, in the great hereafter. They certainly don't make cartoons like they used to. Read the article here. Awwww...this is so sad. 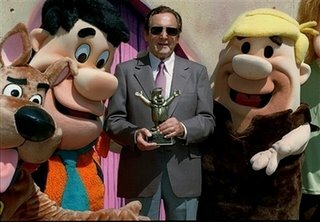 Hanna-Barbera was such a big part of my childhood. I remember going to Los Angeles as a child and making my parents find Hanna-Barbera studios just so I could take a picture in front of it. We will all miss Joe Barbera...if not for him, television cartoons might be entirely different.